A thermal imager is not your typical night vision device. Instead of drawing from light to produce images, this one uses the ambient heat emitted by objects to detect and identify the source before displaying the image. These sophisticated scopes were once just available to the military but in recent years; civilians can own the best thermal scope for the money for the purpose of sporting activities as in hunting. These scopes have a peculiar appeal to the pros in law enforcement. This is because the need to obscure one’s location is higher than in any other industry. They do not require any form of light to produce images, such that the user can have no image reflection. Their other attraction is by small animals and dangerous game hunting. These scopes make it possible to make precise, fast shots and zero in on fast moving targets without detection. A lot goes in the selection of a thermal imaging rifle scope, many models claim to be the real deal, but only a few can meet the actual ground thermal vision scope needs. We’ve done the work for you and identified only the models that cut it. This means the rate at which a digital image is refreshed after being presented the first time on the display. In today’s thermal imagers, that rate is measured in hertz (Hz), where you’ll find many models have between 30-60Hz capabilities. A higher number means the image is refreshed multiple times in a short time; hence the image looks alive and the eye can, in fact, identify what that image represents. Choose a thermal imager with the lowest hertz rating of 30 and move your way up from there. This is important when tracking moving objects so that they don’t appear wavy through the display and you miss the window of taking an accurate shot. As is typical with thermal imagers, they all have more than one crosshairs to offer. But the number of options makes all the difference. A lesser number of reticles is easier to work with because you won’t have to make a lot of adjustments when sighting in your rifle. Some brands do not come with a reticle option, so if you need a thermal imager with a reticle, it’s important to examine the real offerings of that thermal imaging scope. The graphics of the image you see in the display is reflected in pixels. As is the case with the refresh rate, a high number means the image is clear and crisp. A small number distorts the image displayed in digital form so be sure to check this figure so that you can be set for the most unpredictable situations in the field. If you are in Law enforcement, the resolution means much more because you don’t want to be caught aiming at the wrong target. It may cost you much more than you paid for the scope, so it’s better to be safe than sorry on this one. Every thermal imaging scope needs power to operate. In this case, lithium batteries are the common mode of powering for these scopes. Getting one with the longest life is a bit of a hassle and those that can keep a charge for at least eight hours are very pricey. The good thing is that they have the allowance of packing up extra rechargeable batteries, bought independently from the scope. Most of the rechargeable batteries offer more hours and are lightweight so you can take them along each time you plan on using your scope. To close in on a target, you’ll need to have the clearest image on your display. The zoom ability works hand in hand with the resolution and is either an optical zoom or a digital zoom. For optical zoom, it’s what you’d usually see with a magnifying lens. The digital zoom is what makes the difference. It must have the backup of the optical zoom so that you don’t lose the resolution of the image. Otherwise, a scope with just the digital zoom as an independent function will just be another day of tracking and losing targets. Night vision devices use the light on glass optics to deliver the images, but this is not always the case with an infrared rifle scope. Glass insulates heat so it may obscure what you are deemed to see on display. A good, high-quality thermal imaging scope uses germanium lenses since they can be made to absorb light without blocking the infrared heat used for thermal imaging. Germanium tends to be very expensive. In fact, we can say it’s the primary reason these scopes have a hefty price tag. 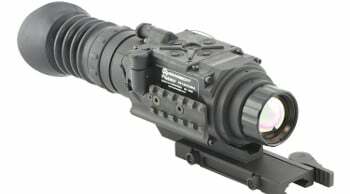 Description: The Armasight Predator FLIR Tau 2336 is a military grade clip-on-scope that is dedicated to the weapon you choose. You don’t need to re-zero your scope, one you have sighted it in the first time. It provides digital control for the six reticle patterns it avails. On the standby mode, you can use a remote control to switch it from a weapon scope to a handheld thermal imager or just a spotting scope. 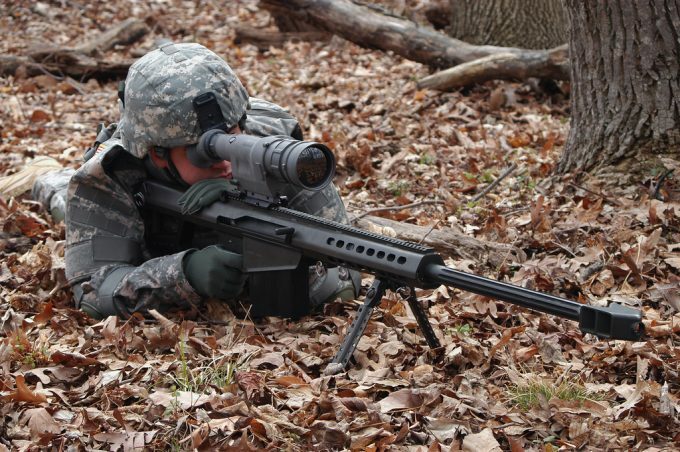 It is packed with the ability to scope through fog or smoke when used in long range target acquisition. 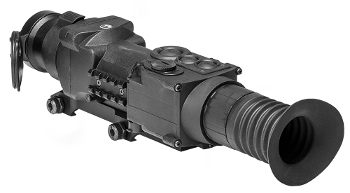 This is the safest thermal imaging weapon sight which draws primarily from uncooled, magnified long-wave infrared to showcase images on an OLED display system. It has an electrical zoom function varying from 2x-8x which gives a wider field of view than regular thermal imaging scopes. The display system is ideal for areas where one needs to completely mask their location because it does not require a backlight to display images. It affords a high resolution of 336x256p, and you can choose from thirteen image pallets on the OLED and four reticle colors to give excellent contrast, improving how you lock on the target. The user interface has a small learning curve and is easy to use in the field. It is a user-friendly design where the buttons, electronic controls and the direct combination of the functions patterned in a drop menu. Any user can explore and make quick changes once they get the hang of it. 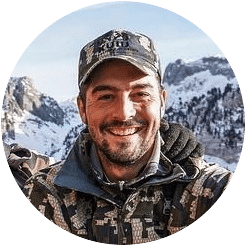 This scope can relay video output, and you have the option of inputting an SD card to record the videos so that you can view the hunting escapades later. 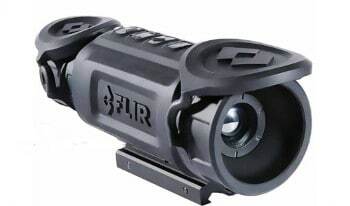 Description: The FLIR Systems RS64 Thermal Night Vision is the most reliable hunting thermal scope. You’ll find the State-of –the-art technology allows for optimum image correction to give better clarity in total darkness. 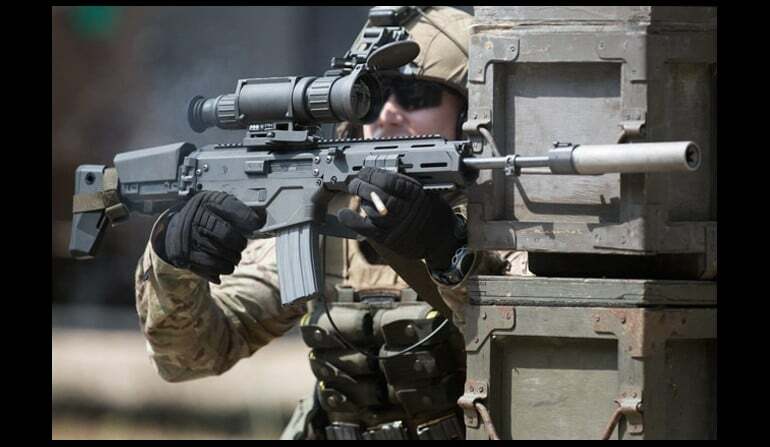 It uses three variable reticle systems which can be easily interchanged and you’ll never need illumination since it uses long waves of heat emitted from objects in focus. It comes with an LCD active matrix display with a 640×480 resolution to present the images in better view. You’ll love working with this scope since it carries a simple control system that entails only four buttons to operate the whole system. You can also access the color mode adjustment and even make changes to the reticle choices on the scope. The good thing is that it is built to take recoil rated for the MSR semi-auto .308 Cal. And, weighing around two pounds, it improves the overall balance of the weapon. The lithium-ion batteries that come with this unit can make it through four hours of continuous use. What’s even more pleasing is that they can be recharged using a USB cable, thus eliminating the need for carrying spare batteries, you just plug in and have continuous use of the scope. The digital capabilities of this unit have the capacity to take videos and record the events as they unravel in the field. What’s more, this unit is fully submersible up to 30minutes in shallow water. Related: If you’re keen about your home security, you can also include the FLIR FX Wireless Wi-Fi Indoor Video Monitoring security camera. It carries advanced sensors to detect sound, temperature humidity and motion to give accurate results for what you cannot see. It can relay many events in a summarized version that saves you time and keeps you connected. You can also look at the FLIR Systems Outdoor HD Video Wireless Camera. It is most useful as a monitoring device to take along for added night security. Description: The ATN Thor Thermal Weapon Scope is a make we all love because it is the only smart solution scope we have on this list. It utilizes the ATN Obsidian core, typical of delivering high zeroed functions with the help of an inbuilt rangefinder. This scope calculates the point of impact, based on the rangefinder and shifts it each time to meet any new incline angle and windage is set. This shows you’ll always be in the kill range to make consistent shots on target. 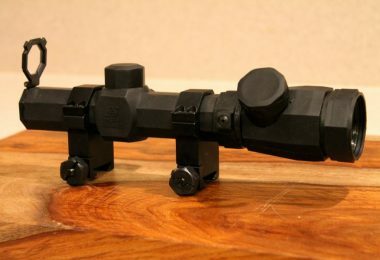 If you plan on using several weapons, this scope keeps the zeroed properties of each rifle so the next time you reinstall it, you will just be ready to shoot as soon as you’re done with the mounting. It has the perfect smooth zoom that brings every target into close view on the OLED display system that gives a resolution of 800×600 pixels. 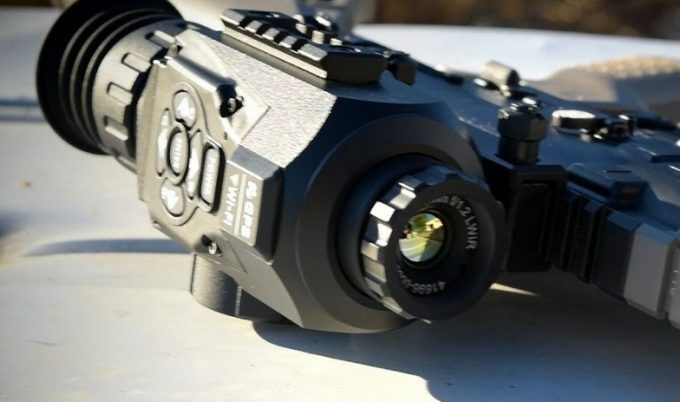 It can record HD videos in 1280×960 pixels, with the Recoil Activated Video (RAV) function, it records the shooting series from the moment before you take the first shot until after you’ve made the kill. When it comes to interacting with this scope, the user interface is ergonomically designed, placing each function at your fingertips. It features a directional pad that makes it easy to change the color palette on the reticle as well as adjust to one of the five patterns on the reticle. With a magnification of 5x, this scope is designed to take shots in mid-range to long range shooting. The battery included on it has a slightly longer operation time of around eight hours. The ATN Thor Thermal Weapon Scope is water and dustproof. This makes ranging in highly obscured environments manageable because it utilizes uncooled vanadium oxide Microbolometer. With the E-zoom, you can have an image enlarged up to 50x its original size. These advancements make it the most versatile thermal imaging scope you can acquire on the market. Related: Don’t cut short your hunting because of a low charge battery. Get 22 hours with the ATN Power Weapon Kit. It includes a 20,000 mAh battery with an L shape connector compatible with this scope. It is easy to recharge so have the most out of it. Also, if you have a problem zeroing your scope manually, use the ATN Thermal Targets Kit. It is a set of three which eliminates the search for a thermal target when trying to zero your scope the first time. 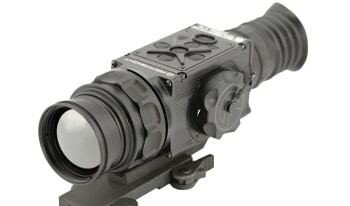 Description: The Armasight Zeus Thermal Imaging uses long waves to provide rich thermally intensified images. It comes in a 42mm tube which makes adjusting for windage and elevation come easy. It is a compact sized scope designed to either mount on a weapon or handheld. This thermal scope utilizes an uncooled microbolometer core, crucial from delivering the highly contrasted images with the environment. It comes with a shuttered eyeglass guard to keep reflection of ambient light away from your eyes. This makes blending with the night much easier. With this scope, you’ll experience quick target acquisition because you can choose from six reticle patterns and adjust the image brightness through a digital zoom from between 1x, 2x,4x,8x. More so, your scope can measure the temperature enabling you to change the viewing preferences so that you don’t lose the range of the target. It allows 2MOA windage and elevation adjustments at every turret click. A clear view is made possible by the organic colored LED screen to relay images in 800x600pixels resolution. You’ll be in total control of your activities in the field through the simple design of the functions which are relayed on a simple keypad on the body of the frame. 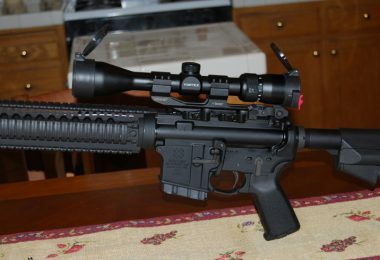 It also has the E-Zoom function where in this case it allows adjusting of the digital zoom in 1x,2x-4x without changing the zeroed properties by the targeting reticle. With Armasight Zeus, you can control it remotely when leading a tactical team through random surroundings. The aircraft aluminum construction ensures it can face off rough terrain. It is also submersible for half an hour up to 10meters. This scope features a quick release locking mechanism on a standard Weaver or Picatinny rail. 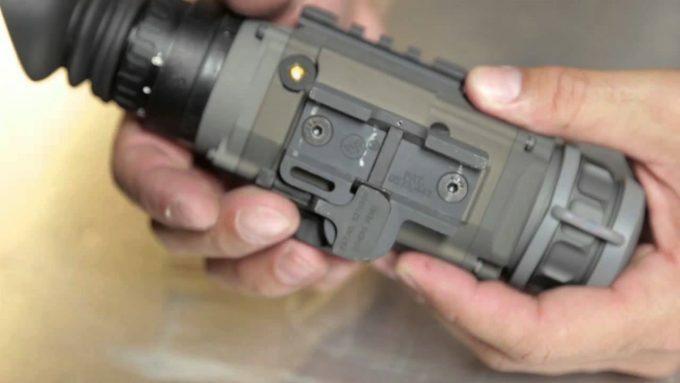 This makes reinstallation retain any set functions so it can be of use on many rifles. With such refined, properties, you can be sure to have a smooth time working with this scope. Related: You can’t afford to miss out a relay of the events that take place in the field. Get the Armasight HD DVR Digital Recorder that will transform your time in the field. It can accommodate SD cards with up to 32GB of memory and provides instant playback of the events recorded. Description: The ATN X-Sight II Smart Riflescope represents the best accompaniment for your rifle in low-lit environments. It draws from the advanced Obsidian II core to switch from day and night with a simple touch of a button. It carries a distinct rangefinder that takes target acquisition to whole new level. The X-Sight II smart rangefinder helps in calculating the position of the target just by focusing the scope towards the aim and the rangefinder identifies the point of impact. It carries the duplex red on green reticle and focuses the aim on HD optics which relay the image in 1080 pixel resolution. Since it has lower power magnification, the image is always sharp even towards the edges where it may be blurry with other scopes. It gives the allowance of a smooth zoom that brings the aim into closer view than it actually is. The settings can also be made from a remote location such that with your smartphone and the Obsidian app, you can focus your scope without manually clicking on any button or turret. This is only possible with the Wi-Fi and Bluetooth connection functions on your smartphone. You can venture further into the woods without risk of getting lost. It carries a GPS function that makes it easy for you to know your current location, where you’ve been and how to navigate into or out of your current surroundings. Perhaps the best convenience is recording high definition digital videos with the Recoil Activated Video (RAV). It can withstand the recoil of heavy rifles to help in taking videos covering the whole shooting experience. To store the videos, you’ll need an SD card which does not come with the scope. Overall, it is a reliable make to add to your hunting thrills. Related: You’ll want to invest in the ATN Power weapon kit, to extend the time you spend hunting. It offers up to 22hours, and it’s rechargeable. 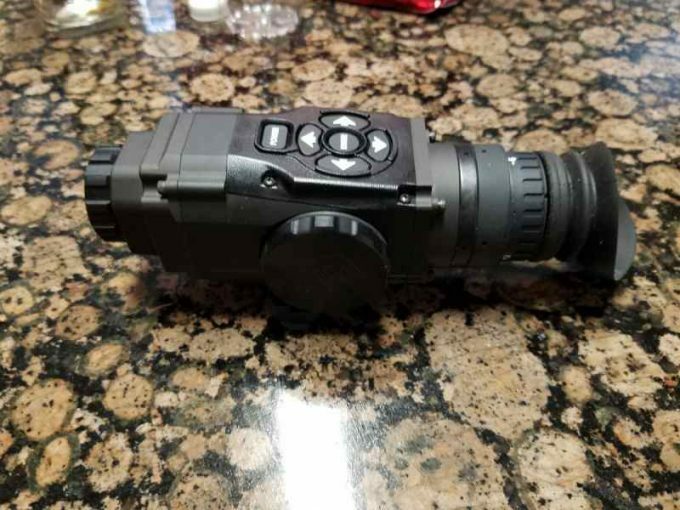 Also, do not forget to carry the ATN infrared illuminator.It can mount on your scope and can deliver 85mW; it suits law enforcement, hunting, and military usage. Description: The Pulsar Apex is a competitive model with better offering than any other model on the market. It has an LCD screen that displays images with a 384 x 288 pixels resolution. With it, you can see very clear images where the eye readily meets the view. This is a long range scope where it can range as far as the human eye can still detect 1400 yards and the images produced. It delivers 50Hz refresh rate that is fast enough to beat the needs of the dedicated hunter. 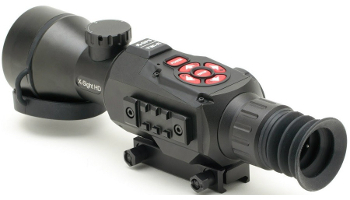 It carries two types of reticle functions where you can either use the optical magnification or the E-Zoom to focus. The Pulsar Apex has ten reticle patterns to choose from which can be electronically identified and set on the main focus reticle. This way, you can change the color scheme on the reticle from either a black or white theme. It also has the picture in picture mode; you can view an optical magnification on top of an electronically zoomed image. It comes in handy when taking consistent shots on a fast moving target. 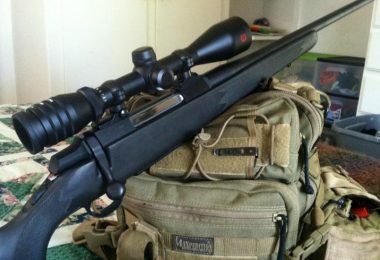 The zero set is repeatable to rifles with a Weaver or Picatinny mount option because it locks the position of the settings to be carried on when it is reinstalled on different guns. This scope comes with an easy to control menu. It is a three-button menu where you can quickly adjust the calibration modes or change the variable zoom with one of the buttons. Now the calibration methods, it can be set manually, semi-automatically or automatically through a remote control. The three operations are essential for when covering different grounds. With this scope, one can set the display off but still keep the other functions ON. This means you can navigate in total obscurity and be ready to shoot in an instant by just turning the display on. This scope has so much to offer yet it is very lightweight and easy to work with. Related: You can only do so much with 5-hours of battery life, that’s why we recommend the Pulsar’s Battery Pack EPS31. 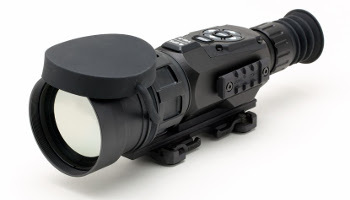 It is rechargeable and comes with a weaver mount to keep a low profile on your riflescope. It has a charge indicator and arrives in a tight plastic body. Now that we have gone through the various thermal scope reviews, we hope you can tell the design of a well thought out scope. Remember; these thermal scopes are meant to keep you safe in an environment where human eye visual imagery is next to impossible. Although some brands may have a very high price tag, they all reflect the value of what you are in line to gain. Be careful to choose only the scope that fulfills your unique needs as making compromises with a thermal scope can be fatal in the field. Good Luck. If you have experience with any of these, please let us know your thoughts in the comments section below.